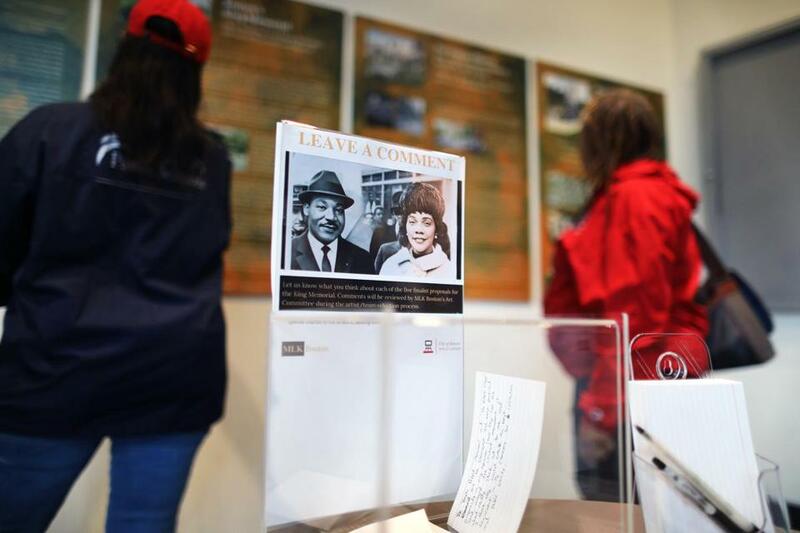 People who walked through the Bruce C. Bolling Municipal Building on Tuesday were invited to leave comments about the five designs proposed for the new Martin Luther King Jr. and Coretta Scott King memorial. If Paul English has his way, Boston Common is about to be shaken up. Tuesday brought the unveiling of five potential designs for a memorial to the Rev. Martin Luther King Jr. and his wife Coretta Scott King. English has spearheaded a drive to create a memorial to the Kings in Boston, and the announcement of the design finalists represented a huge step forward for the project. Any of the designs would be transformative for the Common, which is exactly what English had been hoping. The march to an MLK Memorial in Boston has been methodical and steady — both unusual words to apply to a public project in which so many people feel a deep stake. But since English kicked off the $5 million project last year by kicking in $1 million of his own money, the finish line has always been in clear sight. The idea of a memorial to the Kings seemed to come out of nowhere. Though the city has long celebrated the Kings’ ties to Boston, no one had ever proposed a major project like this one, rooted in the idea that King and his legacy belong as much to Boston as to any other city. Then again, perhaps the unveiling of the designs themselves will mark the beginning of the hard part, in terms of building consensus. The public will have an opportunity to comment on the designs through Oct. 16, with a winner selected in November. The renderings can be viewed online at MLKBoston.org. they are also on display, in far more dramatic form, at the Boston Public Library in Copley Square or at the Bruce C. Bolling Municipal Building in Dudley Square. While there were things I liked about each of the designs, at first blush my vote might go to “Boston’s King Memorial.” It would be a simple bridge on the Beacon Street side of the Common, spanning an existing walking path. Bridges occupy a significant symbolic importance in King’s work, and I also like its proximity to the sculpture commemorating the Massachusetts 54th Regiment — currently the city’s most prominent piece of public art honoring African-American sacrifice. The project is an unusual one, and the person behind it is unique too. Many people now actively involved in the project had never heard of English, a white tech entrepreneur, who had zero profile in the city’s civil rights community. But a visit to a King memorial in San Francisco stirred his passions, and he decided his hometown needed one of its own. English estimates that the sculpture will be completed 12 to 18 months after a winner is selected. A second component — a “learning center” in Dudley to incubate civic activism in the King tradition — remains in the early conceptual stage. Brandon Terry, a brilliant young King scholar at Harvard, has taken the lead on planning that part of the project, with a group of young African-American entrepreneurs committed to raising money for it. The idea of King as a part of Boston’s history is one to eagerly embrace. Not only was his time here truly formative, his was a message this city still needs to absorb. And what better place than in Boston’s de facto town center?